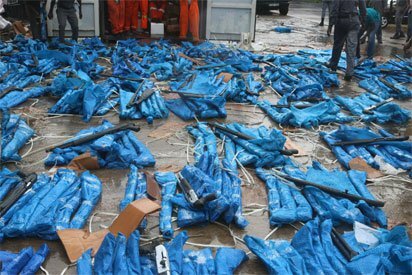 Barely a week after it intercepted a 20-foot container load of 1,100 pump action rifles, the Tin Can Island Command of Nigeria Customs Service, Monday, uncovered yet another set of 475 rifles shipped in by the same importer. 1,100 Jojef Magnum Pump Action and Jojef Magnum Plastic Single Barrels Hunting Gun Pump Action Rifles seized by Customs at Lagos Tin-Can. Vanguard gathered that the guns were discovered after the Customs Area Controller of the Command, Comptroller Bashir Yussuf, ordered a detailed profiling of the importer of the 1,100 rifles intercepted last week. The container, belonging to the same importer, with marked CMAU189817/8. This is the fourth seizure at Tin Can Island Port within eight months. Recall that Customs arrested four persons but disclosed only two to the press. One of those arrested is said to be a senior staff of Tin Can Island Container Terminal, TICT. A source, who witnessed the examination of the container, told Vanguard that the rifles were concealed with small connecting pipes. The source said: “The container is owned by the same importer of the 1,100 guns. After a detailed profiling of the importer ordered by the Area Controller, it was discovered that he still has another container inside the port; so they fished it out. At press time yesterday, the container was being examined at the enforcement unit of Customs, while a large number of Customs Intelligence Officers, CIU, and enforcement officers barred port users from witnessing the counting of the guns. Efforts to reach the Deputy Controller in charge of enforcement at Tin Can Port, Mr. Dera Nnadi, proved abortive as all calls to his phone were not answered. Recall that the Comptroller General of Customs, Col Hameed Ali (retd.) had last Monday, displayed 1,100 rifles imported into Tin Can port from Turkey. The importation came through the Tin Can Island Container Terminal, TICT. A customs officer and Terminal Clerk of the terminal were arrested in connection with the seizure. Ali said the Customs will hold the terminal operator responsible for the illegal import and queried how the container found its way into the examination bay, even though it was not positioned or listed for examination. He said the all the guns were imported from Turkey. He added that the bill of lading of the container falsely indicated the content to be wash hand basins and water closets, but a thorough examination revealed that it contained 600 pieces of Jojef Magnum Black Pump Action Rifles.